With Pee Gee Hydrangeas now past their full blooms, these amazing flowers can become the perfect resource to get inspired to create something both festive and timely. This year I decided to make something new and interesting with my abundance of spent hydrangea flowers. For anyone who adores the hydrangea flowers when in full season, autumn brings new colors and textures to their already spectacular display. So here’s a fun new way to embrace their beauty. I’m no stranger to picking every last flower off my Pee Gee Hydrangea at this time of year. I often make some of the most over the top arrangements, which actually never require water. But this year I wanted to do something fresh and new. With my newly organized “Mar” shed ready for business I stood inside and pondered. 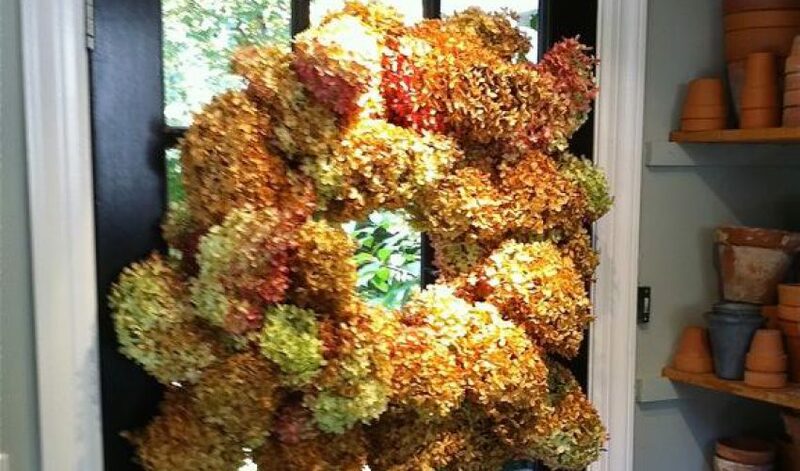 And I came up with something new that I just love: my wireless hydrangea wreath. This wreath design project guarantees you will never scratch any surface because — unlike most wreaths — there is no wire needed. With all my supplies available and my clippers in hand, I went to my standard (topiary shape) 15-year-old Pee Gee Hydrangea. I greeted her as I normally do, taking a moment to thank her for the breathtaking display of flowers that has graced Rosebrook Gardens over the years. Trimming her is not just about using her flowers but always a way to promote new growth and build strength to her now well-established branches and trunk. I proceeded to clip her majestic flowers one at a time, leaving a 15-20 inch stem on each. Once I snipped 25 of the best flowers I was ready to begin assembling the wreath. Having a table on hand will help support your arrangement — it’s important to note that your new wreath will be constructed in a way that it will have a good side and a bad side. The bad side will lie flat on a door or wall while the breathtaking side will be the eye candy show stopper for all to see and enjoy. I carefully remove every last leaf off branch stems. This exposes the flower as the only focal point. Now lay two flowers parallel to each, with one flower about 6 inches “ahead” of the other, then begin to wrap the stems with floral tape. Start the wrapping on the stems right below the flowers themselves. After about 6-7 generous wraps of floral tape, add another flower, and repeat. To create the circular shape, when adding each successive flower be sure to angle to blossom stem a little. (Cutting the hydrangea before frost means they stay flexible enough.) Add remaining flowers, securing the stems as tightly as possible. Should you accidentally break off a flower head: congratulations, so did I! Simple fix: just remove the stem and begin again. Practice makes perfect. If all has gone well you should be able to connect back to your starting point. Use some twine to connect the last stems to your original starting point. Once secure, cut off any excess twine. Be careful if trimming excess stems: don’t cut so close to the tape that you risk the whole structure coming loose. A sMARt tip: If you can’t see the step from the front, leave it as is. To secure and support the entire wreath, secure 3 more times with twine as you did to connect the starting point. Leave one extra long piece of twine at the top of your newly formed wreath as a way to secure on a hook. Always make sure your hydrangea flowers are dry to the touch with no wet or soggy flowers. Don’t wrap too close to the flower as this pressure will cause the flower head to snap off. Wrap tape about 6 inches below the actual flower. The more you wrap the stems with floral tape the less likely your flower stems will break — making it easier to bend into a circle. When done, add other individual stems as desired by weaving them into the wreath form. Secure each with a piece of floral tape. If using the wreath indoors, spray with hairspray to discourage loose blooms from falling off. If using the wreath outdoors, use a clear spray paint to give a longer life if it gets wet from rain or snow. 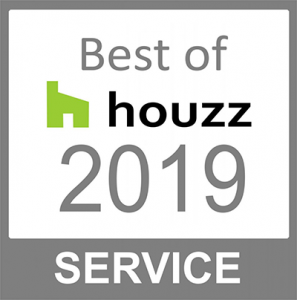 Best displayed under a porch roof or in a protected area from the weather for a longest lasting display. This is a simple, wonderful project that can be done in less than half an hour once you have everything available and on hand. It makes a perfect gift that keeps on giving. For the holidays you can even spray it gold or silver for that extra festive feel. This will last you through the season, but is only meant for single-use, as it will get dusty and as it dries it becomes more fragile. One final note. I highly recommend you discard it (and all single-use holiday dÌ©cor!) by MARch as you can’t begin spring with something old!